Windows 10 is set to be released tomorrow (across 190 countries, as a free upgrade or with new PCs and tablets.) Ahead of the launch, Microsoft has revealed a website dedicated to its launch. So, how do you benefit from the website? Microsoft has divided the page into 4 major sections - July 29, Upgrade your World, Why Upgrade and Media Assets. Clicking on July 29, will browse you to the section where you see a World Map as a background together with the tweets, from the people talking about Windows 10, moving around the map one at a time showing the respective location. I actually like this one the most. It is pretty awesome! 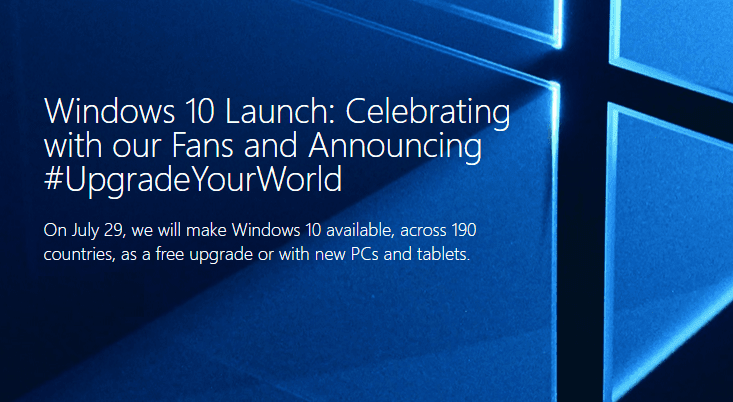 On July 29 fans will be celebrating Windows 10 around the world. Join in the conversation using #UpgradeYourWorld. Upgrade your World section details the Microsoft's commitment to bring Windows 10 devices to all forms of engagement whether it is to safeguard the environment or the creation of lifesaver technology, it is just about time to #UpgradeYourWorld. Next up is the 10 Reasons to upgrade to Windows 10. If you click on any of the 10 reasons below, it will take you to a more detailed and dedicated page. Try it out! And last but not the least is the Media Assets. Here you will find the videos, documents and product screenshots. In the videos, Microsoft talks about the Windows 10 experience, the built in apps, and the Microsoft Edge browser and more. The document section consists of Windows 10 Quick guide, which we covered earlier here. Don't forget to download it!